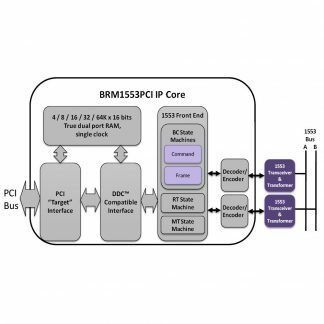 The BRM1553D IP core adds MIL-STD-1553 functionality suitable for any MIL-STD-1553 implementation to an FPGA. The core incorporates a back end logic that arranges the messages in a predefined memory and registers structure, which simplifies the interface between the MIL-STD-1553 bus and the local CPU. 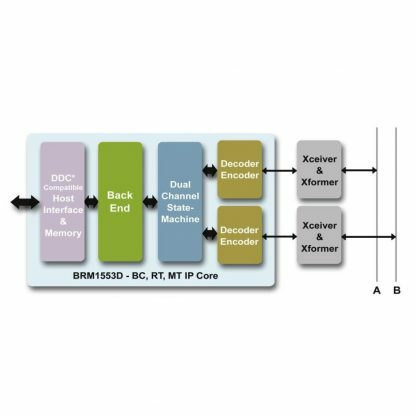 The BRM1553D core can act as a replacement (2nd source) for DDC® Enhanced Mini-ACE® devices as the data is arranged in the same way. 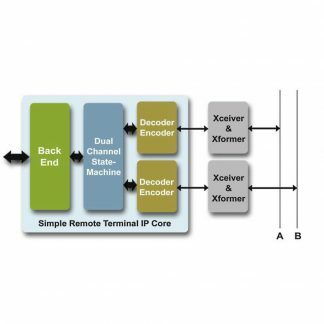 Includes DDC® Enhanced Mini-ACE® interface, compatible with existing drivers and applications. A small gate count is required from an FPGA device even for complex applications, minimizing cost and the space required on the target board. The unique Manchester decoder can work with any clock frequency from 12Mhz and up to reduce clock sources and clock domains onboard (reduces EMI/RFI) and ease the integration with back-end interface. Advanced algorithms for filtering out noise and disturbances enable the core to operate in harsh environments. 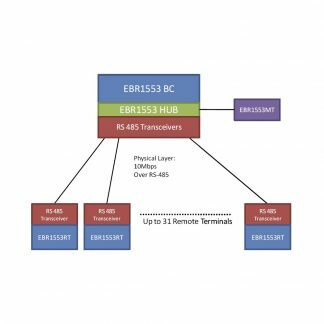 The BRM1553D IP core connects to any standard transceiver-transformer pair. The core was fully validated with a 3rd party dual transceiver.